Award-winning travel writers Kaila Yu and Kiki Wong have inspired thousands of followers and travel fanatics to explore the world and shared their stories on outlets such as FOX News, Forbes, VICE, and more. Let them show you the exact steps to take to live your life without boundaries. Written by my dear Travel Blogger/Influencer friends, they unveil useful tips on Traveling the Globe with 30 practical daily actions. 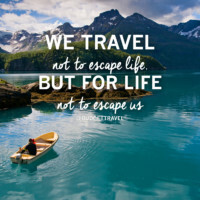 This includes the million dollar question of how to afford to travel, budgeting, how to find more time, choosing your dream destination, travel hacks, importance of attending travel conferences, joining online travel communities and most importantly, how to work through limiting travel beliefs. 30-Day Travel Challenge is a spiritual, holistic, and practical guide to channeling more travel into your life. ** Find an interview with me on Page 200 on how I have used passive income through Real Estate Investing to Travel more! Do you wish you could travel for free? Of course you do.